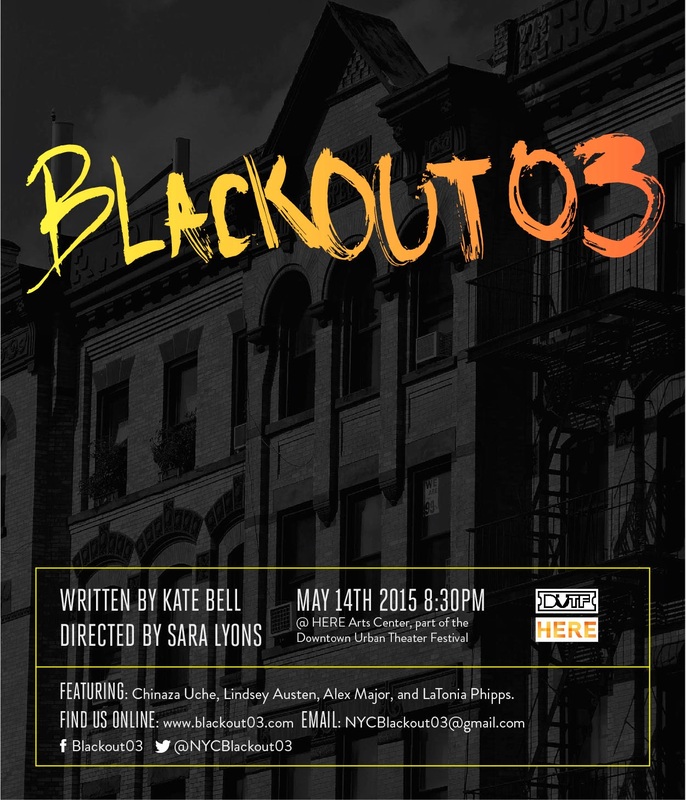 I have been busybusybusy getting all systems go for the first production of my play Blackout03 in this year's Downtown Urban Theater Festival. It's SOLD OUT, but we still need support for our Indiegogo campaign. A pledge of any amount helps us cover costs, and the support will also help me to develop/produce my entire series of BLACKOUT PLAYS over the next couple years. THE BLACKOUT PLAYS: a trip through forty plus years of New York City history and an imagined future, exploring how NYC race and class tensions have evolved (and how they've stayed the same). Blackout03 in DUTF is a jumping-off point for the larger project and being SOLD OUT for the first production is incredibly exciting! My director Sara Lyons has been a joy to work with, along with our extremely talented cast: Lindsey Austen, Alex Major, LaTonia Phipps, and Chinaza Uche. And a big shout-out to Keri Taylor Landeiro who's signed on as our stage manager, and is making my life much, much easier. Here are some pictures from rehearsals...more updates to come! Lori and Tiffany (Lindsey and LaTonia), the Moon Nymphs, "doing things with their feet." Tiffany (LaTonia) and Sam (Alex) playing Tug-of-War with Lori (Lindsey) with Sara looking on. Sam (Alex) and Jonathan (Chinaza) taking a "bro moment."